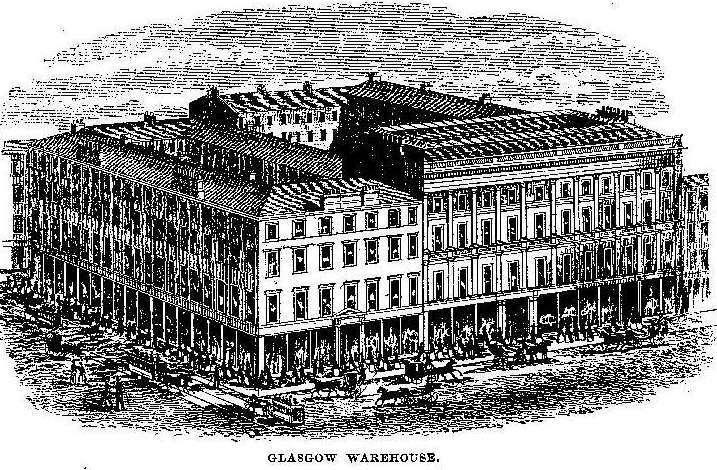 Among those Glasgow firms whose progressive spirit and continuous enterprise have been instrumental in developing in the cityÂ’s streets a number of commercial establishments, the magnitude and vast dimensions of which must stand as a striking tribute to the influence of the cityÂ’s trade, that of Messrs. Stewart & McDonald holds a position of unexcelled noteworthiness and distinction. This house is one of the mercantile powers of Glasgow, and its huge warehouses in Buchanan, Argyle, and Mitchell Streets have long passed the vague and indeterminate stage of being known as a mere depot for the receipt and sale of merchandise, and have taken their place among the recognised "lions" of the city, a sight to be seen and wondered at by every conscientious visitor to the trade capital of Scotland. The house of Messrs. Stewart & McDonald was established in 1826, at its present address and under its present title. The business was inaugurated in quite a small way, and from time to time, as the trade grew and developed, additions were made to the premises. In 1866 the greatest extension of the establishment took place, and the warehouse in its entirety is now of positively colossal proportions. The block covers a ground area of fully four thousand square yards, and the new portion is six storeys in height, the whole block forming a most handsome frontage to the two most important thoroughfares in Glasgow, Argyle Street and Buchanan Street, the main entrance being in the latter fashionable promenade. Looking over the records of the enlargement of the premises, the first addition of notable importance is found to have been made in 1860, when the block was extended into Mitchell Street. Another great addition has been made in consequence of the premises not even yet being large enough for the business, and another block was added which extends into Union Street. These premises are connected with the main building by means of a subway. These premises are used for packing purposes, and are known as the Great Packing Hall. The latest improvement has been a fine addition to the noble Buchanan Street frontage, effected late in the year 1887. The originators of the business in 1826 were Mr. Robertson Buchanan Stewart and Mr. John McDonald, and the personnel of the firm to-day comprises Mr. Robert Kedie, Mr. John R. Stewart, and Mr. Ninian B. Stewart, junior, these last two gentlemen being respectively the nephew and the grandson of Mr. Robertson Buchanan Stewart. Mr. Ninian B. Stewart, junior, thus represents the third generation of his family in connection with the business. In 1859 Mr. N. B. Stewart joined the firm, and a few years later Mr. A. B. Stewart also became a partner. On the death of his father Mr. N. B. Stewart became senior partner, and under his vigorous direction the business made giant strides on the path of progress. Gifted with untiring energy and no ordinary degree of commercial capacity and foresight, Mr. N. B. Stewart strengthened at every point the foundations of the house as laid by his father and Mr. McDonald, and it is not too much to say that to his earnest efforts the firm owes that enhanced security of position and fund of resource which has enabled it to pursue unfalteringly and steadily the course of advancement he so decisively marked out for its future career. Eventually Mr. N. B. Stewart retired, but shortly before that event Mr. Crombie, who had previously for many years been cashier to the firm, was admitted to a partnership. Mr. Crombie died in 1882. Mr. A. B. Stewart, brother of Mr. N. B. Stewart, and now also deceased, was a notable figure in the personnel of the firm during his term of association with the business. He was one of the most generous and popular of GlasgowÂ’s prominent merchants in his day, and filled with great credit offices as Justice of the Peace for the city, and as deputy lieutenant and convener for the county of Bute. Unfortunately this gentleman died when comparatively a young man (only about forty-five), deeply regretted throughout the whole district. His charitable disposition was well known, and he was always first and foremost in all acts, either of a charitable nature or tending to the improvement of his fellow townsmen. Mr. Robert Kedie, who had for many years most successfully managed a number of the principal departments of the business, and was admitted as partner in 1882, is now managing partner in this prosperous and eminently representative firm, and is ably seconded by the Messrs. Stewart above-mentioned as colleagues with him, who share with Mr. Kedie the responsibilities, no less than the emoluments, attaching to the conduct of a mercantile enterprise of such magnitude and influence. The business as it is constituted to-day, deals with every branch and division of the wholesale dry goods and textile trade, and the departments represented in stock are thirty-three in number, comprising the following classes of goods : cloths, silks, cottons, flannels, linens, (Stewart & McDonald) ribbons, merinoes, prints, muslins, laces, handkerchiefs, haberdashery, yams, winceys, wove shawls, moleskins, carpets, tweeds, furs, hosiery, mantles, wool shawls, skirtings, fancy dresses, straw hats, millinery, flowers, white cottons, gloves, shirts, ready-made clothing, Bradford stuffs, stationery, and underclothing. Each department is distinct and separate from the others, and is under the supervision of a buyer and manager, who is directly responsible for the satisfactory condition and working of the division under his charge. The entire stock is one of simply enormous volume and variety, and aggregates in average value the year round something like half a million sterling. Special attention is paid to dress materials. In this connection there are four distinct departments, with an experienced and capable buyer at the head of each. English, French, and German dress goods are stocked in almost endless variety, and the section for Scotch dress goods is a complete exposition of every class of costume fabric produced in the kingdom. Another particularly notable section is that for ready-made clothing, in which an immense assortment is shown, direct from the firmÂ’s factories at Leeds and Glasgow ; and the carpet department contains one of the largest, richest, and most exhaustively varied stocks of home and foreign floor coverings to be found in Great Britain. For the rest it is impossible to say more than that each division of the stock is completely representative in its particular line, and that the goods shown embrace the products of the best centres of supply, purchased in the most advantageous markets, and listed at prices fully in accordance with every requirement of a pushing and competitive age. Messrs. Stewart & McDonaldÂ’s price-list is a study in itself, an epitome in volume form of the features of the trade they exemplify, and is remarkable for those points of system and good arrangement which, are among the most noteworthy characteristics of the vast emporium from which, it emanates. Merely to set foot within the confines of this firmÂ’s magnificent warehouse is sufficient to supply an approximate idea of the magnitude of the business transacted in every department. Indeed, perhaps a general form of the same idea could be gathered simply from a glance at the exterior of the establishment, with its lengthy, lofty, and imposing frontages, its long range of stately plate-glass windows, and its host of features indicative of immense mercantile activity. Messrs. Stewart & McDonald employ about two thousand hands altogether, the warehouse staff numbering fully five hundred alone, and they have between sixty and seventy travellers constantly on the road waiting upon their connection in all parts of Great Britain and Ireland. Sixty-two commercial travellers! What an opportunity is here offered for speculative deductions as to the volume of business which can justify and find profit in the retention of such an army of commis voyageurs! The cellarage attached to the premises is very extensive, and the whole basement is practically devoted to packing and shipping purposes, there being distinct and separate departments in this respect for the home and export orders. There are six powerful hydraulic lifts in various parts of the buildings, the place is heated from end to end with hot-water pipes, and there is no detail of convenience or commodiousness that could tend to the advantage of the establishment that has not received the fullest consideration. 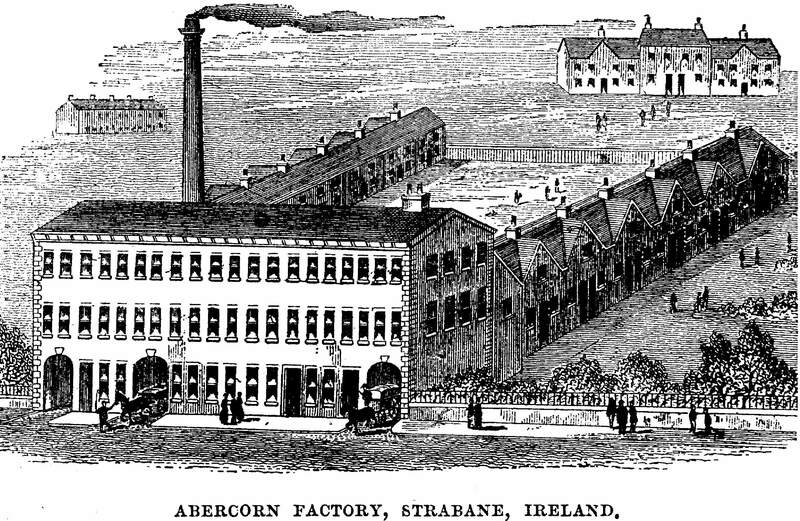 Messrs. Stewart & McDonald have three immense factories under their direct control and proprietorship Â— one at Leeds for ready-made clothing ; one at Strabane, Ireland, for shirts, collars, and ladiesÂ’ and childrenÂ’s underclothing ; and a third in Dunlop Street, Glasgow, for ready-mades, woollen shirts, childrenÂ’s blouses, costumes, mantles, and pinafores. These factories afford employment to a great amount of skilled labour, and are equipped in the most complete manner, their productive facilities and capacities being developed to the highest degree. The firm have branch establishments at London, Edinburgh, Liverpool, Rochdale, Birmingham, Belfast, Dublin, Newcastle, Leeds, Preston, Hull, Montreal, Toronto, Melbourne, Sydney, Dunedin, and Port Elizabeth ; and at several of these branches large and important stocks are held. The trade of the house is one of very great magnitude and universal extent ; and such is the splendid development of the export department that there is practically no town, city, or district in any quarter of the globe to which the commerce of Great Britain has influentially penetrated that does not offer a ready and profitable market for the goods of this firm. The whole business furnishes one of the most forcible illustrations advanced in modern times to indicate the possible achievements of well-directed energy, enterprise, and personal capacity, for from these three indispensable commercial qualities has been drawn the stimulus through which the trade of Messrs. Stewart & McDonald has attained to its present colossal proportions, and acquired its almost phenomenal range of operations in every part of the civilised world.